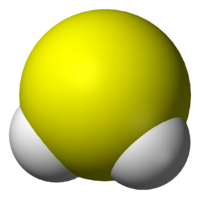 Hydrogen sulfide is a chemical compound with the formula, H2S. It is a colorless, toxic, and flammable gas, and is responsible for the foul odor of rotten eggs and flatulence. It often results from the bacterial breakdown of organic matter in the absence of oxygen, such as in swamps and sewers (anaerobic digestion). It also occurs in volcanic gases, natural gas, and some well waters. The odor of H2S is commonly misattributed to elemental sulfur, which is odorless. Hydrogen sulfide is useful for a number of applications. For instance, it is used to prepare organosulfur compounds (sulfur-containing organic compounds) and various metal sulfides and hydrosulfides. A number of metals are separated from their ores by treating the minerals with hydrogen sulfide. Alkali metal sulfides are used for the degradation of biopolymers. Hydrogen sulfide is also used to activate certain catalysts and to separate heavy water (deuterium oxide) from normal water. Produced in small amounts by some cells of the mammalian body, hydrogen sulfide functions as a vasodilator and is also active in the brain. Moreover, hydrogen sulfide plays a key role in the sulfur cycle, the biogeochemical cycle of sulfur on Earth. 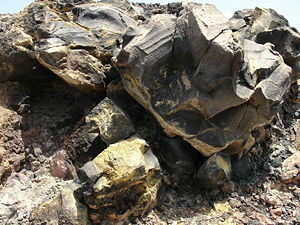 Deposit of sulfur on a rock, caused by volcanic gases. MS + H2O to give MO + H2S. Sulfate-reducing bacteria obtain energy by oxidizing organic matter or hydrogen with sulfates, producing H2S. These microorganisms are prevalent in low-oxygen environments, such as in swamps and standing waters. Sulfur-reducing bacteria (such as Salmonella) and some archaea obtain their energy by oxidizing organic matter or hydrogen with elemental sulfur, also producing H2S. Other anaerobic bacteria liberate hydrogen sulfide when they digest sulfur-containing amino acids, for instance during the decay of organic matter. H2S-producing bacteria also operate in the human colon, and the odor of flatulence is largely due to trace amounts of the gas. Such bacterial action in the mouth may contribute to bad breath. Some evidence suggests that hydrogen sulfide produced by sulfate-reducing bacteria in the colon may cause or contribute to ulcerative colitis. About 10 percent of total global emissions of H2S are due to human activity. By far the largest industrial route to H2S occurs in petroleum refineries: The hydrodesulfurization process liberates sulfur from petroleum by the action of hydrogen. The resultant H2S is converted to elemental sulfur by partial combustion via the Claus process, which is a major source of elemental sulfur. Other anthropogenic sources of hydrogen sulfide include coke ovens, paper mills (using the sulfate method), and tanneries. H2S arises from virtually anywhere that elemental sulfur comes into contact with organic material, especially at high temperatures. Some scientists have suggested that a buildup of hydrogen sulfide in the atmosphere could have caused the Permian-Triassic extinction event 252 million years ago. The molecular structure of hydrogen sulfide is similar to that of water (H2O). This is understandable because oxygen and sulfur occur in the same group of the periodic table. Ka = 1.3×10−7 mol/L; pKa = 6.89. The sulfide ion, S2−, is known in the solid state but not in aqueous solution. The second dissociation constant of hydrogen sulfide is often stated to be around 10−13, but it is now clear that this is an error caused by oxidation of the sulfur in alkaline solution. The current best estimate for pKa2 is 19±2. Hydrogen sulfide reacts with many metal cations to produce the corresponding metal sulfides. (Sulfides should not be confused with sulfites or sulfates, which contain the sulfite ion SO32− and the sulfate ion SO42−, respectively.) Well known examples are silver sulfide (Ag2S), the tarnish that forms on silver when exposed to hydrogen sulfide of the atmosphere, and cadmium sulfide (CdS), a pigment also known as cadmium yellow. Transition metal sulfides are characteristically insoluble, thus H2S is commonly used to separate metal ions from aqueous solutions. Hydrogen sulfide is corrosive and renders some steels brittle, leading to sulfide stress cracking—a concern especially for handling "sour gas" and sour crude oil in the oil industry. Hydrogen sulfide burns to give off the gas sulfur dioxide, which is more familiar as the odor of a burnt match. Al2S3 is readily prepared by ignition of the elements. Several organosulfur (or thioorganic) compounds are produced using hydrogen sulfide. They include methanethiol, ethanethiol, and thioglycolic acid. Upon combining with alkali metal bases, hydrogen sulfide converts to alkali metal hydrosulfides and sulfides, such as sodium hydrosulfide and sodium sulfide, which are used in the degradation of biopolymers. The depilation of hides and the delignification of pulp by the Kraft process are both effected by alkali metal sulfides. Hydrogen sulfide was used in analytical chemistry for well over a century, in the qualitative inorganic analysis of metal ions. For such small-scale laboratory use, H2S was made as needed in a Kipp generator, by reaction of sulfuric acid (H2SO4) with ferrous sulfide (FeS). Kipp generators were superseded by the use of thioacetamide, an organic solid that reacts with water to produce H2S. In these analyses, heavy metal (and nonmetal) ions (such as Pb(II), Cu(II), Hg(II), As(III)) are precipitated from solution upon exposure to H2S. The components of the resulting precipitate redissolve with some selectivity. As indicated above, many metal ions react with hydrogen sulfide to give the corresponding metal sulfides. This conversion is widely exploited. In the purification of metal ores by flotation, mineral powders are often treated with hydrogen sulfide to enhance the separation of the metal. Metal parts are sometimes passivated with hydrogen sulfide. Catalysts used in hydrodesulfurization are routinely activated with hydrogen sulfide, and the behavior of metallic catalysts used in other parts of a refinery is also modified using hydrogen sulfide. Hydrogen sulfide is also used in the separation of deuterium oxide (known as heavy water) from normal water, by a process called the Girdler Sulfide process. Hydrogen sulfide is produced in small amounts by some cells of the mammalian body and has a number of biological functions. It is produced from cysteine by various enzymes. It acts as a vasodilator and is also active in the brain, where it increases the response of the NMDA receptor and facilitates long-term potentiation, which is involved in the formation of memory. Eventually, the gas is converted to sulfites and further oxidized to thiosulfate and sulfate. As its effects are similar to those of nitric oxide (without the potential to form peroxides by interacting with superoxide), hydrogen sulfide is now recognized as a potential cardioprotective agent. Vasoactivity of garlic is caused by catabolism of its polysulfides to H2S, a reaction that could depend on reduction mediated by glutathione. In trisomy 21 (the most common form of Down syndrome), the body produces an excess of hydrogen sulfide. Hydrogen sulfide is a highly toxic and flammable gas. Being heavier than air, it tends to accumulate at the bottom of poorly ventilated spaces. Although very pungent at first, it quickly deadens the sense of smell, so potential victims may be unaware of its presence until it is too late. Hydrogen sulfide is considered a broad-spectrum poison, meaning that it can poison several different systems in the body, although the nervous system is most affected. The toxicity of H2S is comparable with that of hydrogen cyanide. It forms a complex bond with iron in the mitochondrial cytochrome enzymes, thereby blocking oxygen from binding and stopping cellular respiration. Since hydrogen sulfide occurs naturally in the environment and the gut, enzymes exist in the body capable of detoxifying it by oxidation to (harmless) sulfate. Hence, low levels of sulfide may be tolerated indefinitely. However, at some threshold level, the oxidative enzymes will be overwhelmed. This threshold level is believed to average around 300-350 ppm. Many personal safety gas detectors are set to alarm at 10 ppm and to go into high alarm at 15 ppm (Utility, sewage, and petrochemical workers). An interesting diagnostic clue of extreme poisoning by H2S is the discoloration of copper coins in the pockets of the victim. Treatment involves immediate inhalation of amyl nitrite, injections of sodium nitrite, inhalation of pure oxygen, administration of bronchodilators to overcome eventual bronchospasm, and in some cases, hyperbaric oxygen therapy. Exposure to lower concentrations can result in eye irritation, a sore throat and cough, nausea, shortness of breath, and fluid in the lungs. These symptoms usually go away in a few weeks. Long-term, low-level exposure may result in fatigue, loss of appetite, headaches, irritability, poor memory, and dizziness. Chronic exposures to low level H2S (around 2 ppm) has been implicated in increased miscarriage and reproductive health issues amongst Russian and Finnish wood pulp workers, but the reports hadn't (as of c. 1995) been replicated. Higher concentrations of 700-800 ppm tend to be fatal. 0.0047 ppm is the recognition threshold, the concentration at which 50 percent of humans can detect the characteristic odor of hydrogen sulfide, normally described as resembling "a rotten egg"
800 ppm is the lethal concentration for 50 percent of humans for 5 minutes exposure (LC50). A practical test used in the oilfield industry to determine whether someone requires overnight observation for pulmonary edema is the knee test: If a worker that gets "gassed" loses his balance and at least one knee touches the ground, the dose was high enough to cause pulmonary edema. In 2005, it was shown that mice can be put into a state of suspended animation by applying a low dosage of hydrogen sulfide (80 ppm H2S) in the air. The breathing rate of the animals sank from 120 to 10 breaths per minute and their temperature fell from 37 °C to 2 °C above ambient temperature (in effect, they had become cold-blooded). The mice survived this procedure for 6 hours and afterwards showed no negative health consequences. Such a hibernation occurs naturally in many mammals and also in toads, but not in mice. (Mice can fall into a state called clinical torpor when food shortage occurs). If the H2S-induced hibernation can be made to work in humans, it could be useful in the emergency management of severely injured patients, and in the conservation of donated organs. In 2006, it was shown that the blood pressure of mice treated in this fashion with hydrogen sulfide did not significantly decrease. Hydrogen sulfide has been implicated in some of the five mass extinctions that occurred in the history of the Earth. Although asteroid impacts are thought to have caused some extinctions, the Permian mass extinction (sometimes known as the "Great Dying") may have been caused by hydrogen sulfide. Organic residues from these extinction boundaries indicate that the oceans were anoxic (oxygen depleted) and had species of shallow plankton that metabolized H2S. The formation of H2S may have been initiated by massive volcanic eruptions, which emitted CO2 and methane into the atmosphere which warmed the oceans, lowering their capacity to absorb oxygen which would otherwise oxidize H2S. The increased levels of hydrogen sulfide could have killed oxygen-generating plants as well as depleted the ozone layer causing further stress. Small H2S blooms have been detected in modern times in the Dead Sea and in the Atlantic Ocean off the coast of Namibia. ↑ Scientific American, Impact From the Deep. Retrieved December 8, 2007. ↑ W. Giggenbach, Inorg. Chem (1971). ↑ Hydrogen Sulfide, in Ullmann's Encyclopedia: Industrial Inorganic Chemicals and Products (Weinheim: Wiley-VCH, 1999, ISBN 3527295674). ↑ PubMed, A new gaseous signaling molecule emerges: Cardioprotective role of hydrogen sulfide. Retrieved December 8, 2007. ↑ PubMed, Hydrogen sulfide mediates the vasoactivity of garlic. Retrieved December 8, 2007. ↑ S. Ramasamy, S. Singh, P. Taniere, M.J.S. Langman, M.C. Eggo. Sulfide-detoxifying enzymes in the human colon are decreased in cancer and upregulated in differentiation, Am J Physiol Gastrointest Liver Physiol, 291:G288-G296. Retrieved December 8, 2007. ↑ Iowa State University, The Science of Smell Part 1: Odor Perception and Physiological Response. Retrieved December 11, 2007. ↑ BBC News, Mice put in "suspended animation." Retrieved December 8, 2007. ↑ Mark B. Roth and Todd Nystul. Buying Time in Suspended Animation. Scientific American (2005). ↑ B.B. Jørgensen and D.C. Nelson, Sulfide oxidation in marine sediments: Geochemistry meets microbiology, in J.P. Amend, K.J. Edwards, and T.W. Lyons (eds. ), Sulfur Biogeochemistry—Past and Present (Geological Society of America). Committee on Medical and Biological Effects of Environmental Pollutants. Hydrogen Sulfide. Baltimore: University Park Press, 1979. ISBN 0-8391-0127-9. Concise International Chemical Assessment Document 53. Kamoun, P. Abstract of survey article on H2S as used by the body. This page was last modified on 22 January 2018, at 20:03.